This seven room exclusive eco-lodge is located in the De Hoop Nature Reserve, one of South Africa’s most dramatic beach locations and home to some of the world’s best land based whale watching. 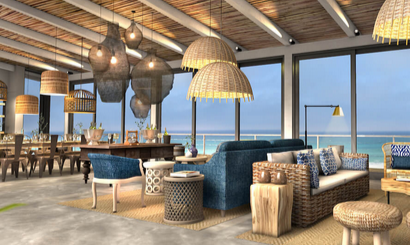 The rooms are positioned along six kilometres of pristine white sand and each is fronted with floor-to-ceiling windows overlooking the Indian Ocean. The main area has the same fabulous views and a wraparound deck from which to enjoy them. Activities will focus on learning about and exploring the spectacular beach, its rockpools and intertidal zones, and the fabulous fynbos. Lekkerwater has been built with the utmost respect for the natural environment. The property’s electricity is generated from the sun and wind; grey water treatment is the latest and cleanest; there is a zero single use plastic policy and the vast majority of the supplies (and superb wines) are produced from within a 40-mile radius of the lodge. Available through Aardvark Safaris from £170per person per night. Cost includes full board accommodation, house wines, beers, drinks and all activities. Situated in the north-eastern corner of Akagera National Park, Magashi Camp overlooks beautiful Lake Rwanyakazinga. Accommodation is in six spacious tents with architecture and interiors evoking homage to traditional Rwandan culture. The main area comprises a luxurious lounge, dining and bar area, pool and expansive viewing deck with a convivial fire pit.Akagera comprises some of the most scenic savannah in East Africa and his home to one of Africa’s highest hippo densities, some very large crocodiles, rare sitatunga and over 500 bird species. Teeming with plains wildlife, Akagera now also boasts a healthy population of lion, reintroduced into the park in 2015 after a 20 year absence, as well as black rhino which were reintroduced in 2017. Visitors combining three nights in two separate Rwanda parks benefit from reduced price gorilla permits ($1,000 vs $1,500) so Magashi Camp is a welcome addition to the safari circuit in this fascinating country. Available through Aardvark Safaris from £360 per person per night. Cost includes full board accommodation and safari activities. Rather than focussing on luxurious accommodation, Linyanti Expeditions will delight visitors with the experience on offer. Stand out personalised service and an emphasis on walking safaris along with game drives and mokoro trips offer a wonderful way to explore the exceptional Linyanti wilderness. Likely wildlife encounters include lion, wild dog, elephant as well as hippo and crocodiles. The six comfortably appointed tents will have an en-suite bathroom and bucket shower taking guests back to a bygone era of the original expedition style camps. Two communal tented areas will accommodate the dining area and library/lounge. The camp is seasonal and operates from May to October. Available through Aardvark Safaris from £570. Cost includes full board accommodation and safari activities. Eight luxury tents, including a family unit, are set on decks connected by walkways which meander between the rocks and trees of this unique site. Overlooking the Deteema springs which host prolific wildlife, including large elephant herds during the dryer months and a resident pride of lion, the camp offers the opportunity to view incredible wildlife both in the park and from the luxury of the tent veranda. The area is one of the best for walking in Hwange with seeps and springs, and varied topography and vegetation providing excellent wildlife habitat. For those wanting to sit back and relax, the nearby Deteema Dam offers world class viewing. Available through Aardvark Safaris from £330 per person per night. Cost includes full board accommodation and safari activities. Deka Camp, Hwange National Park, Zimbabwe – June 2019Just six tents make up this intimate camp in the wild north west of Hwange National Park. Nestled atop a small hill overlooking the permanent water of the Deka seeps, the views stretch seemingly forever. Available through Aardvark Safaris from £440 per person. Cost includes full board accommodation and safari activities. 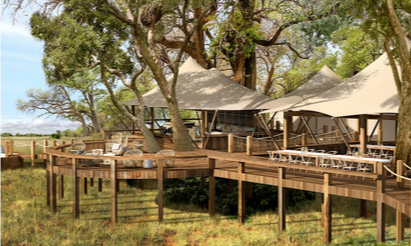 Tuludi, Okavango Delta, Botswana – July 2019Located in the Khwai Private Reserve in the northern reaches of the Okavango, Tuludi looks set to be one of Botswana’s most exclusive camps. Just seven tents are set in 200,000 hectares of pristine wilderness where animal sightings are plentiful and other guests are not. Each of the tree-house styled luxury tented rooms has uninterrupted views of the wildlife filled floodplains along with an indoor lounge, a separate dressing and sleeping area, indoor and outdoor showers and an al fresco bathtub. Outside there is a sunken seating area and a private plunge pool. Available through Aardvark Safaris from £785 per person per night. Includes full board accommodation, house drinks and all safari activities. Takwela, North Luangwa National Park, Zambia – July 2019 Takwela offers an intimate wilderness experience and a rare opportunity to visit a beautiful and unexplored area of the North Luangwa. The park hosts a highly successful black rhino sanctuary and healthy populations of lion, hyena, elephant, buffalo, leopard, wildebeest, and wild dog. Takwela will accommodate a maximum of four guests in two en-suite chalets, with two more chalets planned for 2020. The camp will be solar powered, built primarily from local natural materials and constructed using local skills. The North Luangwa National Park is one of Africa’s last true wilderness areas and Takwela, situated on private land at the confluence of the Luangwa and Mwaleshi Rivers, will have almost exclusive access to over 50 km of Luangwa River frontage. Guests will be able to explore on game drives and bush walks. Aardvark Safaris has established itself as the African safari and beach specialist. Offering the hottest wildlife locations and the best-kept safari secrets, the company prides itself on its intimate knowledge of the 18 countries in which it plans holidays, and has built one of the best teams of safari experts in the business. Aardvark Safaris organises top-quality holidays throughout Southern and East Africa and the Indian Ocean Islands, offering unrivalled advice on safari holidays. Specialists in organising family safaris, riding safaris, gorilla treks, wildebeest migration, philanthropic safaris, honeymoons, Kilimanjaro climbs, walking safaris, canoe safaris and incredible beach holidays.